Bangladesh. Rohingya refugees who fled Myanmar to safety in Cox's Bazar. While the massive humanitarian effort so far – led by the Bangladesh Government with international support – has saved countless lives, these children are becoming increasingly anxious about their futures, and vulnerable to frustration and despair. “The obligation we have as a global society is immense: to give children and young people the world has defined as ‘stateless’, the education and skills they need to build decent lives for themselves,” said UNICEF Executive Director Henrietta Fore, after visiting the world’s largest and most congested refugee camp over two days earlier this week. In Myanmar, most Rohingya have no legal identity or citizenship, denied documentation by the Burmese Government. And since August 2017, when the vast majority were forced to flee for their lives from into Bangladesh, children are not being registered at birth. They lack any legal identity and official refugee status. 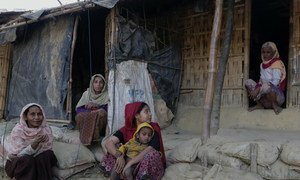 Until conditions in Myanmar allow those eligible to return home, Rohingya children remain a minority without status, according to UNICEF. They are excluded from a formal education curriculum and in desperate need of skills. “Without a legal identity, they are at the mercy of traffickers and drug dealers”, said UN Humanitarian Envoy, Ahmed Al Meraikhi, who accompanied Ms. Fore. He stressed that we must agree collectively to “invest in this generation of Rohingya children, so that they can better navigate their lives today, and be a constructive part of rebuilding Myanmar’s social fabric when they are able to return”. Currently, UNICEF reaches 155,000 children ages 4-14 with a learning programme that progressively includes higher quality and more structured learning and skills. In 2019, it is prioritizing older adolescents to improve foundational literacy and numeracy, along with relevant vocational skills. The UN agency will also strongly focus on supporting the local host community in Cox’s Bazar, one of the poorest districts in Bangladesh. UNICEF Bangladesh is appealing for $152 million in 2019 to provide 685,000 Rohingya refugees and host community residents with critical support. As of February, it has received only 29 per cent of the funding. “If they become self-sustaining”, Ms. Fore asserted “their communities will also become self-sustaining and flourish”. “With the right investment, the Rohingya can be an asset to their community and to the world”, concluded the UNICEF chief.